Board Meeting Minutes are the official record of what occurred at a meeting. They protect against liability, provide evidence of decisions, and provide a clear list of actions and next steps. Minutes play a crucial role on both sides of the board table – executives and directors. Minutes provide the evidence that management has delivered the information directors need to provide effective oversight. Minutes also document that the directors have fulfilled their duty to make decisions that will successfully guide the organization. When people first start taking minutes, they are often thrust into the situation with little formal training or support. Learning on the job risks mistakes that could have legal implications. But it doesn’t have to be this way. Here we set out to answer the most common questions about meeting minutes, provide a meeting agenda template for use, and offer concrete tips to make your meeting minutes more effective. 1. Who Was There: One of the most important aspects of Minutes is creating a record of everyone that was in attendance. It is a vital record that demonstrates the directors are meeting their fiduciary duty. 2. Every Action Matters: Meetings Minutes should track actions, from conception through to completion or abandonment. 3. What, Why, How: The primary question minutes should answer is what was discussed, the reasons decisions were made, and action items that will be completed in pursuit of those decisions. 4. The Body Acts As One: Meeting Minutes generally do not include the specific person speaking. Instead, it should cover the broad topics of conversation, the deliberations, and action items. 5. Avoid Acronyms: Meeting Minutes should be free of acronyms, jargon, and industry speak to avoid future confusion. 6. Write In The Third Person: ‘we’, ‘our’ and ‘us’ should be avoided when writing minutes. If a meeting takes place and there are no Minutes, did the meeting happen? These and other questions can occupy the mind of the Corporate Secretary as they contemplate writing yet another set of Minutes. People who attend meetings often will say that ‘they know exactly what was decided’. But more often than not, a slightly different story can be heard from each one. It is the Corporate Secretary who uses professional skill to listen, write and finesse the discussions into a clear and concise written record of the meeting. Minutes play a crucial role on both sides of the board table – executives and directors. They provide the evidence that management has provided and the information directors need to provide effective oversight. They also document that the directors have fulfilled their duty to make decisions that will successfully guide the organization. The sands of time pass quickly through the hourglass, but for the Corporate Secretary, sitting through meeting after meeting can feel like the never-ending day. Same meeting, different day…different day, the same meeting. The ‘sands’ for a corporate secretary are those minutes that tick by during board meetings – but they are extremely important. There is a professional skill in listening, synthesizing, and recording the proceedings in a neutral and standardized way. If taking minutes is your Achilles heel, maybe re-casting your role from note-taker to an architect can help shift your mindset. It is the Corporate Secretary who takes notes but then designs them into an architecture that binds everyone together. This protects against liability, evidencing decisions, and providing a clear list of action for follow-up. Referencing your authority to write the Minutes can highlight your role for all involved. Consider citing the by-law, policy, or other sources that give you the authority to create the Minutes. Those who have reviewed Minutes from a variety of organizations have likely witnessed many different styles and formats. There is no ‘right’ style or structure. Similar to all elements of a governance framework, the Minutes should reflect the needs, culture, and style of your organization and its board. Resources are important. Avoid copying examples from well-staffed organizations if you don’t an organization with a Corporate Secretary and a governance staff of 5. Those organization will have more resources available to create minutes with fancy presentation formats, multilingual versions, or ‘nice to have’ content (background information for each decision item). They will have the capacity to execute the same style effectively and consistently. Identify your ‘must have’ components, then add in other elements if and when you are able to do so. In a larger organization, there may be a corporate secretary to oversee the minutes process. The actual meeting notes may be drafted by other governance or administrative staff – at least in their draft version. In a small business or not-for-profit, it may be the CEO or Executive Director who drafts the minutes, or, approves the draft after their Executive Assistant completes most of the work. Other configurations abound. Assess what makes sense and build your process to match it. There’re several components to meeting minutes that are essential to all organizations. Depending on your industry or sector, there may be other required elements related to specific legislation, regulations, stakeholder expectations, or historical practice. The Minutes should contain an official header that clearly outlines the date, time, place, and type of meeting. To offer visually rich information or additional context, you can use your organization’s logo, a statement about confidentiality/security, or other notation that reflects your organization’s practices. Use the same format consistently for all Minutes. The second basic component of the Minutes is the attendance. Documenting attendance isn’t just an administrative exercise, it is important that the board record reflects who planned to attend, and who actually attended. This makes it clear which directors were present, and which absent when decisions were made. In the event of litigation or other issues, this could become very important evidence. Accurate attendance records are also important from a tracking perspective, over time. Investors and/or other stakeholders may be interested in monitoring the attendance habits of directors to ensure that they are fulfilling their duties and obligations. Use as much detail as you like but ensure that the names of those intended to be present are listed, and those who are absent are recorded. If anyone is participating via telephone or video conference, note it. Titles can be included if you have the time. The more robust the corporate record, the easier it will be when someone requests research into the historical board records. Once attendance has been recorded, transition into the main body of the Minutes with an Opening of Meeting paragraph. It should note the time the meeting begins, the person in the Chair, and the person taking Minutes. The body of the Minutes will generally have two main components – administrative and substantive business. Most meetings pass quickly through the administrative business of approving the Agenda, approving the previous Minutes, and perhaps approving a Consent Agenda if used in your organization. A Consent Agenda can be used to adopt a series of items on one motion. It will save valuable meeting time for more substantive topics. It usually is made up of recurring or administrative items that aren’t expected to generate discussion or debate. Examples might be information updates from a volunteer or advisory committees, ‘notices’ such as quarterly lists of contracts over a threshold amount, or regular monthly HR reports summarizing staffing changes in the organization. Basically, the routine business that the board can acknowledge with one motion. • or other relevant information that documents the larger context or the nature of the proceedings and discussions. Be sure to document any decisions, including informal agreements of general consent, regular motions, and formal resolutions. In most cases, the Minutes should reflect what was done, not what was said by individuals. It is rarely necessary, unless requested by a director or the chair, to name an individual director in the minutes. However, if directors ask questions during the meeting, it is sound practice to note that questions were asked with a list of the subjects inquired about. Use best practices in the creation of evidence by using consistent formats, language, and procedures at every meeting. A final tip is to include time notations when important or divisive topics are discussed. The time notation against the agenda items gives an idea of how long the discussion continued. This could prove useful for showing the board’s due diligence in the performance of its duties. Minutes are often something that we all put off for another day. We delay and delay since they can seem time-consuming and tedious. However, with the right mindset and day-to-day practices, writing the Minutes can be a well-managed recurring task that isn’t as daunting as seems. Using consistent formats will mean that one year’s documents can be set up as draft versions for the next. The main skeletal outline, headers, and format should always be similar. Simply open previous year documents on your screen, and work in a new version. There is much that can be cut and pasted into the current year version as a base for the new text. There are still a few steps to take before your Minutes are ready to act as evidence of the board record - signing the Minutes. This is the step that formalizes the Corporate Secretary’s vital role in certifying that the record of the proceeding is accurate. It also reflects in good faith the discussions and decisions of the board. In some organizations, the Board Chair may also sign the Minutes. If you are a Board Chair, it is a good practice to not sign any Minutes until after the Corporate Secretary has signed them. That way, you are assured of signing the correct version. OnBoard is the only third generation board portal solution. 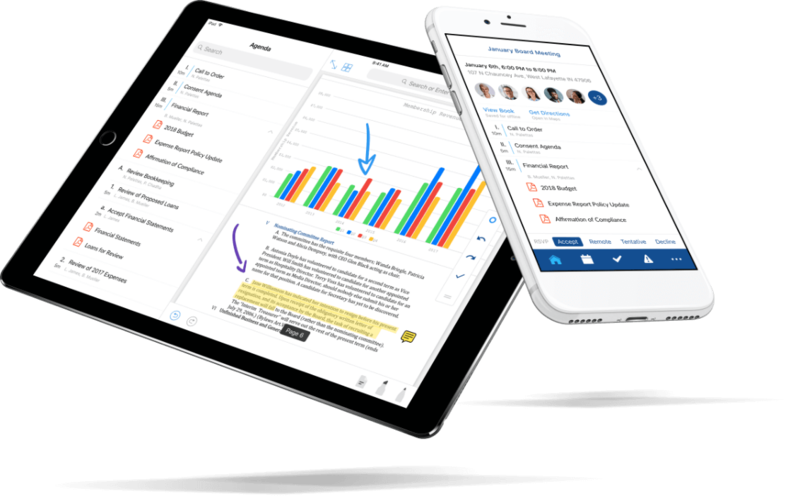 A true multi-device capable mobile platform, collaboration enhancing, highly integrated, meeting productivity tool that puts all these capabilities in the hands of directors with an extremely intuitive, easy to jump in and learn user interface. It’s the only meeting solution that empowers leaders to use technology to make intelligent and informed decisions to achieve their institution’s strategic goals. OnBoard makes preparing for and conducting meetings efficient, secure, and collaborative. And unlike older board portals, OnBoard can be test driven with a free, no strings attached, full feature trial. The leap from print or the first generation of digital to a 3rd generation leader, OnBoard, has never been easier.